"Dark Theme" is a set of extensions aim to bring dark color themes to popular products such as Google Search and YouTube. Each extension is optimized for a single product for better maintenance and better bug tracking. Each extension has an options page to customize color theme to your taste. 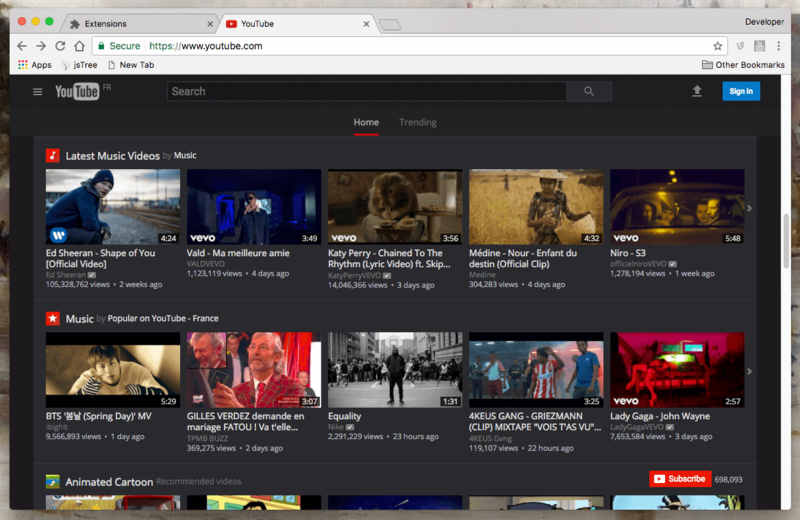 What is the "Dark Theme for YouTube" extension and how does it work? This extension is based on famous Youtube Umbra user-style. However, it is optimized for faster loading and less resource usage. Also it is possible to configure this theme from add-on's options page to make it to your taste. What is the "Dark Theme for Google" extension and how does it work? Dark theme for Google brings dark theme color to Google Search (www.google.com), Google Accounts (accounts.google.com), Google Images (images.google.com), and Google Translate (translate.google.com). There are four different colors that can be adjusted in the options page. Note that this extension is based on https://userstyles.org/styles/124403/google-black user-style. What is the "Dark Theme for Twitter" extension and how does it work? "Dark Theme for Twitter" extension converts twitter.com's color theme to dark mode. Whereas other similar extensions, this extension is using the built-in dark theme of twitter.com and hence has a better compatibility compared to the themes that are installed using add-ons like Stylish or Stylus. This extension offers custom background colors for all the important sections. Use the options page to alter these colors or reset them to the default values. Is it possible to configure colors used by this extension? By default the extension converts all colors to charcoal/blue theme, however all colors are accessible from options page and you can configure them get more personalized dark theme. What are the colors that are currently configurable on "Dark Theme for YouTube" extension? Can I apply my own custom CSS rules to the default dark theme? In the new release of all my dark theme extensions, I am adding a new text area to the options page, so that the user can append custom CSS rules. This way you can fine-tune the theme to match the theme to your needs. Note that this feature is not yet available on all the dark theme extensions. Is it possible to set a time period for the dark theme? I would like the dark theme to get enabled on the night-time period only. Same as the custom CSS rule option, in the new release, there is a new section to set a schedule for the extension to get enabled. Note that when the automatic scheduling is enabled, the extension checks its current state and fixes the enabling or disabling state on IDLE and ALARM events. So if you want to be able to use the toolbar button to disable or enable the extension do not turn the automatic mode on.